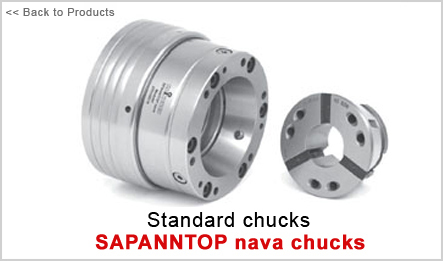 Spanntop Nova: This development represents more than 20 years of Spanntop experience and it exploits all the advantages of the latest machine tools. The components are not only optimized for balance quality, and have an extended guide length. The clamping length of the work pieces is also signifi cantly greater. This chuck is designed for maximum RPM and holding power by providing ideal run out values, it is extremely rigid, and it is even more precise, not to mention it has a longer service life than its predecessor. The position oriented base end-stop of the » combi pull-back« variant can be convenient ly changed from the outside via3 clamping screws countersunk in the chuck, and for the fi rst time it enables top concentricity paired with full through-bore capacity. And naturally your existing clamping heads also fit into the SPANNTOP nova chuck. the result of more than 20 years of experience!